Green’s assessment for the Inland Empire noted how a surging economy had pushed the area’s unemployment to its lowest level since 2006. Although the area remained the hub of affordable housing, the combination of job and population growth had pushed up rents and home prices while driving down apartment vacancies. He further noted how the lack of affordable housing in Los Angeles and Orange counties would enable the inland region to continue attracting renters and buyers to Riverside and San Bernardino counties, further adding to increasing rents and decreasing vacancies. The average rent in the inland region in 2017, was $1,449 and the area had a vacancy rate of 4.18 percent. The forecast average rent for 2019 is projected to rise to $1,573 and the vacancy rate is projected to decline to a low of 3.8 percent. 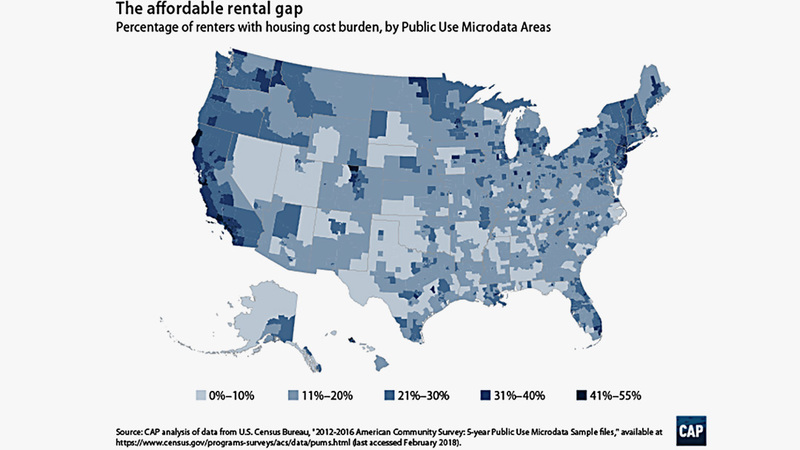 Of the more than 30 million renters across the United States, at least 44 percent of them now pay rents that are unaffordable—meaning, they spend more than 30 percent of their income on housing. Nationally, while the supply of low-rent units has decreased, additions to the rental housing stock is trending in the opposite direction and much of it is shifting to the high end. Rental markets across the nation, like those in the inland region have become tighter, and as rent continues to outpace incomes, more and more renters are finding it increasingly difficult to afford their existing housing needs and still be able to save for a future down payment on a home of their own. The federal government provides more than $120 billion annually in tax benefits for homeownership, but a great majority of low to moderate income people do not own homes and as a result, do not benefit from this option. Other programs like the Low-Income Housing Tax does little to close the increasing gaps in affordable rental housing. A new report by the Center for American Progress titled, “Homes for All” cautioned that when and if the federal government considers contributing more to affordable housing, it should re-evaluate what was previously done in this regard and learn from past mistakes. Such an approach could provide valuable initial steps toward creating a “viable, equitable, and sustainable” response to the rental housing crisis. As a possible solution recommended in the report is a program with the same name—Homes for All. Under this program the federal government would engage in the large-scale construction of affordable and good-quality homes while avoiding the mistakes made in the past several decades in the construction and management of public housing. The program calls for renters to play an active role in the production of affordable units for those in need of affordable rental housing. Strategists believe this approach to housing will accomplish three goals. First, it would challenge private-market development practices that greatly influence home prices. Next, it would encourage long-term affordability, and finally, advocates believe it will promote a process where the cost of rental housing will better match household incomes, particularly in proximity to employment centers and areas rapid job growth is occurring. The Homes for All program would involve direct capital grants for the construction and management of new government-funded housing and include several other attributes housing units that will accommodate a mix of incomes; will be part of transit-oriented developments in metro areas; will offer mixed-use developments that includes housing and commercial space; will accommodate several types of households. i.e., single or family; will be scattered throughout a region, etc. Any housing developed under the Homes for All program will be managed and operated by local nonprofit, mission-driven organizations and community land trusts. The Center for American Progress report is available http://www.americanprogress.org/issues/economy/reports/2018/07/24/452645/homes-for-all/ . To review the USC Lusk Center for Real Estate report, visit https://lusk.usc.edu/news/news-release-2017-usc-casden-real-estate-economics-forecast.